Spiers & Boden, one of the most dynamic duos on the UK acoustic music scene will headline the first day of England’s newest folk festival next February - in a special double date. 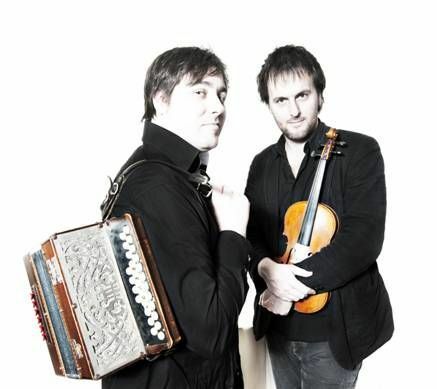 The melodeon, fiddle and singing phenomenon John Spiers and Jon Boden will head to the picturesque Somerset market town of Frome, near Bath, on Saturday, February 18 for a double dose of performances at the start of the much anticipated two-day festival at the edge of the Mendip hills. The new festival, which will be played out at the former 19th century market hall venue The Cheese and Grain and other town locations, is the brainchild of West Country music promoter Jan Ayers, who successfully brought a folk festival back to Bristol after 32 years this spring. Twice winners of Best Duo at the BBC Radio 2 Folk Awards, Spiers and Boden also spawned the mighty 11-piece folk supergroup Bellowhead (whose forthcoming show at The Cheese and Grain is now sold out). Currently celebrating their 10th anniversary year and new album The Works, Spiers and Boden have played everywhere from Glastonbury to the Southbank and the Royal Albert Hall and have been described by The Guardian as “the finest instrumental duo on the traditional scene” and “the contemporary equivalent of Martin Carthy and Dave Swarbrick” while fRoots magazine says “Technically they stand head to head with the best of their generation”.